The Book of Psalms was the prayer book of Jerusalem's Second Temple. Though traditionally associated with King David, some of the psalms were composed by different authors, such as Asaf. Still, the psalms are uniquely adaptable to different times and circumstances, a quality described by the rabbis: "Whatever David says in his book pertains to himself, to all Israel, and to all times" (Midrash Tehillim). There are psalms of praise, complaint, wisdom, and thanksgiving, many of which voice concerns and beliefs still relevant for our time. In Temple days, the Levitical choir sang psalms during sacrificial worship, accompanied by harps and lyres. In fact, the word "psalm" derives from the Greek psalmos, meaning a song with string accompaniment. Of the 150 psalms found in the Bible, thirteen have the title shir ("song"), fifty-eight are designated mizmor ("song set to music"), and many others are labeled "song of praise" tehillah ("song of praise"). Several also include musical "stage directions," indicating the various instruments to be played, and the details of performance. For example, Psalm 120-134 is called the "Song of Ascents," and may have been chanted as the high priest ascended the Temple Mount. Additionally, the literary structure of the psalms suggests that they were divided among singers. This style of singing, known as antiphonal, involves two semi-independent choirs singing alternate musical phrases. And, other psalms were sung in a responsorial manner, in which the choir sang the main text, and the congregation chanted simple responses, such as Amen ("it is so"). 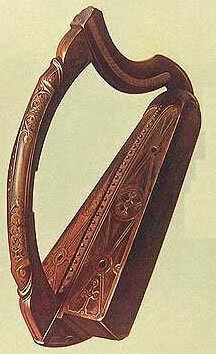 Musical instruments are also referenced throughout the psalms. Psalm 150, for instance, proclaims: "Praise Him with blasts of the horn; praise Him with harp and lyre. Praise Him with timbrel and dance; praise Him with lute and pipe. Praise Him with resounding cymbals; praise Him upon loud-crashing cymbals. Let all that breathes praise the Lord. Hallelujah." In light of all this, it is clear that music was essential to the worship of ancient Israel. Yet, it is impossible to know for sure how that music actually sounded. Nevertheless, musicologists have searched for remnants of this ancient music, hoping to piece together long-forgotten melodies. Guided by the assumption that the earliest Diaspora communities have musical practices closest to the "source," researchers have tried to deduce original Jewish features from the music of Iraqi and Yemenite Jews. In addition to being old, these communities were historically isolated from their non-Jewish neighbors, and virtually unaffected by Western musical developments. However, examination of such music has shown, among other things, the unreliability of this type of theory. As music passes from one generation to the next, some pitches are improperly remembered, and melodies are "corrected" or "improved." Furthermore, Iraqi and Yemenite Jews surely heard and were influenced by the music of neighboring Muslim communities, even if they had little direct contact. Though we cannot hear the ancient music of the psalms, many psalm texts have become part of the Jewish liturgy. Traditionally, there is a different "Psalm of the Day" read each morning, and various psalms appear in weekday, Sabbath, festival, and holiday services. For instance, the Pesukei D'Zimra ("Verses of Praise") for weekday mornings consists of Psalms 145-150, while Psalms 113-118 comprise the Hallel ("Praise") liturgy for holiday services. Even without musical accompaniment, the words of the psalms bear a distinct melodic quality. As Naphtali Herz Imber, poet and author of "Hatikvah," wrote: "In them one finds the deep heartbreaking tones of a Beethoven, as well as the smooth, light, laughing, comic song of an Offenbach; the silent, sweet whisper of love's longing, as well as the wild galloping Hallelujahs suggestive of Wagner's Walküre. In the Psalms is contained the music of the past, present and the future. What wonder, then, that their publisher and editor, King David, lives, and will live, in the grateful memories of the lovers of the best music!" Jonathan L. Friedmann is Cantor at Bet Knesset Bamidbar in Las Vegas, NV, and co-editor of the book, Jewish Sacred Music and Jewish Identity (Paragon House, 2008).